Imagine having an app on your phone that would teleport you anywhere in the world. All of a sudden, just because a concert is only going to be on in one place in the world, doesn’t make it out of your reach. Or a sporting event. Or evacuating a natural disaster. I’m sure there are many people who were trapped in the path of Cyclone Yasi or Hurricane Katrina who would have loved to be able to teleport somewhere safe. But where would I go for my first teleport? I don’t know. It’s tough. On one hand, I could use it to visit long-lost family, or go watch a Man United match. But I think what I would use it for would be to go watch the Proms. Imagine how cool it would be. 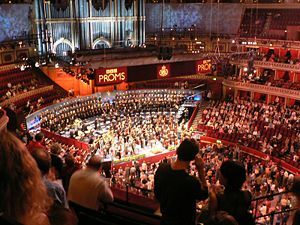 Not only would I not have to pay for flights and accommodation, but I could still be working, here in Perth, for the two months that the Proms are on, and then transport myself over and catch an afternoon concert. I guess the only real issue with that is the time zones. An 8pm concert in England would be a 3am start here. However, I guess I could head straight to sleep when I got home, wake up early, head over to england and watch the concert before heading to work. That might work well. But think of the consequences. The airline industry would be out of business completely, as would effectively all transport modes. Why drive to work when you can teleport there? Every concert and sporting venue is now not only catering for a local market, but a world-wide market. Would every sports ground have to upgrade to have a capacity of 150 thousand or more? Would bands stop touring because they knew their fans could just teleport to where-ever they are? I’m sure there are many benefits of teleporting, particularly getting traffic off the roads. But I’m not certain the positives of convenience outweigh the business world losses. yea, I wouldn’t normally have thought of it either. I still think that if we had the technology, it would be worth it – we’ll just need to adjust to a new way of life. However, even someone were to have a working model that was completely safe, I think it would take more than a lifetime for a) the public to be able to trust it, and b) Governments to swing their minds around to the consequences of it, and allow it for public use. Great way to think about teleporting! I love the idea because in the near future the price of gas will be so out of our range that airline travel and commuter travel will be something only the rich do – or only for those cities that already have public transportation. Teleporting would allow us to grow items that can be used locally and transported when they are fresh – not picked weeks before while they are still green. I don’t think sporting venues would have to change because local people support their local teams. I wouldn’t be going to a match in England or a concert in Switzerland if I couldn’t afford the ticket or if I didn’t like the music- but I might attend a ballet or art museum something that would interest me and maybe not you. It would all balance out, I think. I think teleporting would open up a whole new market – teleport hotels? teleport diners? teleport rest stations? a line of clothing? Things are changing and this invention would be welcome in my world! Thanks for the Comment MK Mercurio. There are some amazing possibilities. Having fresh fruit and vegetables available all year round, and being truely fresh, not frozen and in storage most of the year. I think it’s all possible if the technology is possible (which I’m guessing is not even at the theoretical stage yet). I could see people teleporting to view sporting teams and concerts. Likewise, I would happily transport to see concerts of the Berlin Philharmonic or the art galleries like you mentioned. It doesn’t really matter what it is, teleporting would change the whole world dynamic. Instead of planning a holiday for me to go and see the Berlin Phil, or London Phil, or to visit the Lourve, I could do it one evening when I don’t have anything on at home. I think the biggest issue with this is going to be how Governments view immigration. Currently they can control their entry and exit points. But if teleportation as an app on a phone means you can teleport to any location in the world, these check points are suddenly useless. Perhaps having locations where people could teleport would give them that control, but it then makes it harder – I don’t want to have to go through immigration if I’m just popping off to Germany to view a concert for a couple of hours.